We're posting a series of short profiles that will collectively provide a starting point for an exploration of international blogs, online magazines, and pages. We began by looking at Kilele, We Take Pictures Too, Arab Image Foundation, Greater Middle East Photo, Space Cadet, Street Level Japan, Kantor Berita MES 56, Japan Exposures, Invisible Photographer Asia, my new notebook, oitzarisme, La Fototeca, ZoneZero, Panoramica Galerie, reminders: I WAS THERE, Asian Photography Blog, and Black Man Ray. 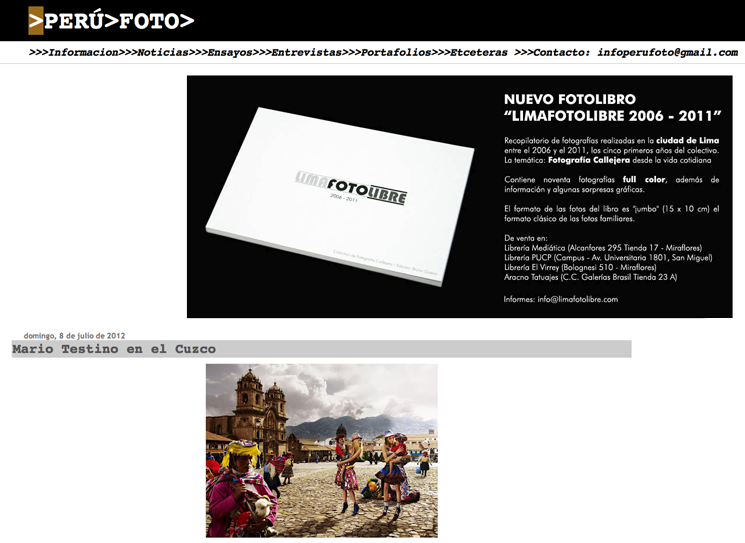 Today we continue with a look at Perú Foto. In a sentence: Spanish language site with short posts generally focused on, but not limited to, photography in Perú. Perú Foto is a omnivorous site, mixing interviews, portfolios, posts on historical photography about or from Perú, international photography news, essays, information on reviews and exhibitions in South America, and pretty much anything else. The site is in Spanish, but most posts are composed of images and its an easy site to navigate if you don't speak Spanish. Navigate through the "Archivo del blog" on the right-hand side to explore older posts. A typical post is 3-5 images with a link to the photographer's site or a few historical images from Lima. It's a great way to discover photographers based in Perú and to learn about what's going on with photography in the country, as well as elsewhere - posts are not strictly limited to Perú. Perú Foto can be found on Facebook.